This release also includes fixes for 25 security vulnerabilities, including at least five rated by Google as High severity. More information on the changes is available via the Release Announcement. Because of the security content of this release, I recommend that you update your systems as soon as you conveniently can. Windows and Mac users can get the new version via the built-in update mechanism; Linux users should check their distribution’s repositories for the new version. If you need to get a complete installation package, you can download it here. One can safely assume that cockroaches are not among the typical urban resident’s favorite animals. While they are not as dangerous as, say, a malaria-carrying mosquito, or a tse-tse fly, they can potentially transport infectious agents, and have been implicated in some human allergies. Mostly, though, people just think that they’re gross. They’re also quite hardy, and able to go for fairly long periods without food or water; getting rid of them can be a chore. More recently, though, users have noticed that the traps were becoming less effective. The New Scientist has a recent article on some research that may explain why. One of the ingredients in the bait used is the simple sugar, glucose. It seems that the roaches have evolved a distaste for glucose. In a paper published in the journal Science, researchers at North Carolina State University in Raleigh discovered that some roaches of the species commonly known as “German cockroaches” [Blattella germanica] had a difference in their neurochemistry that caused glucose to “taste” bitter, a trait which they passed on to their offspring. The use of glucose as a bait in poisoned traps creates selection pressure that favors roaches without a sweet tooth. Hence, the authors suggest, evolution is at the heart of the traps’ decreased effectiveness. This kind of evolutionary “arms race” is similar to what we have seen in the development of antibiotic-resistant bacteria, DEET-resistant mosquitoes, and herbicide-resistant weeds. We humans are quite good, in many cases, at devising ways to modify our environment. But we too often forget that our environment is not just a passive lump of matter — when we push, it frequently pushes back. I’ve written here a number of times over the past couple of years (most recently here) about triclosan, an anti-bacterial and anti-fungal agent that is used in a wide variety of consumer products, including anti-bacterial soaps, toothpaste, deodorant, mouthwash, other cosmetic products, and household cleaning supplies. The US Food and Drug Administration [FDA] has been conducting a safety and effectiveness review of triclosan for some time now. The review was originally scheduled to be released in April, 2011; last summer, it was promised by the end of the year (2012). We’re all still waiting. The Singularity Hub site has an article on this ongoing saga. It gives a bit more of the history: the FDA issued draft guidelines in 1978, which classified triclosan as “not generally recognized as safe and effective”. Since the guidelines were never finalized, nothing changed. The FDA has not given an updated timetable for the release of its review. The May 11 issue of The Economist has an interesting, though disturbing, short article on one measure of global climate change: the percentage of carbon dioxide [CO2] in the atmosphere. This has recently reached a new high in recent history. 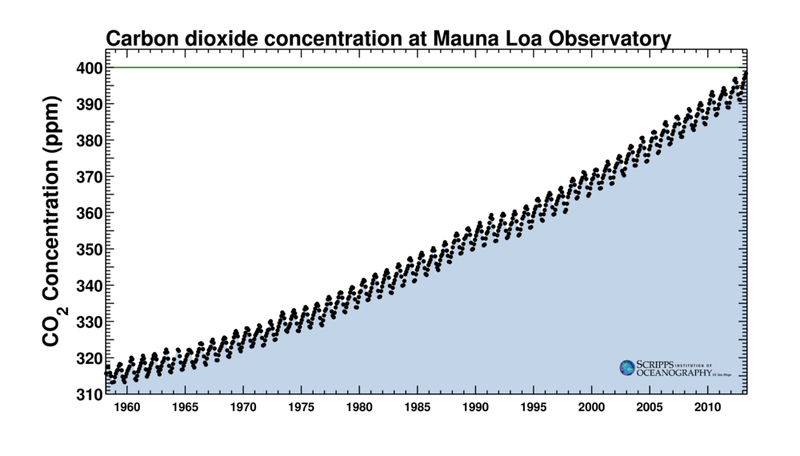 AT NOON on May 4th the carbon-dioxide concentration in the atmosphere around the Mauna Loa Observatory in Hawaii hit 400 parts per million (ppm). Now, 400 ppm does not sound very high; after all, it is only 0.04%. However, as the article goes on to point out, this concentration of CO2 has not been routinely present since the Pliocene epoch, about 4 million years ago. The observation site is remote from large centers of human population, minimizing fluctuations due to temporary pollution spikes. The observations have been made consistently, at the same place, since 1958. There is a regular seasonal fluctuation in CO2 levels, tied to plants’ growth cycles. In the northern hemisphere, levels tend to peak in May, and then fall until about October, as plants’ growth removes carbon dioxide from the atmosphere. The seasonal pattern is clearly visible in the graph. The more striking thing, of course, is the steady rise in the carbon dioxide levels, an increase of more than 25% over the observation period. And there is no evidence that the rate of increase is getting smaller.